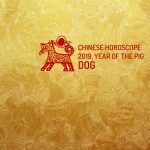 The Chinese Horoscope 2019 for Dog indicates that it will be a good year of the Pig for natives of this sign. However, things will not come easily but will have to be fought for. Their creative ability in different fields of life must be demonstrated. The most appropriate period for dealing with any problems that may occur, especially financial ones, will undoubtedly be between April and June. It will be essential to maintain the objectives that have been set throughout the year of the Pig. You should not waste time on trying to do things that you know too well you are unable to achieve. Those who were born in the years 1910, 1922, 1934, 1946, 1958, 1970, 1982, 1994, 2006 and 2018 are part of this horoscope. It will be at the beginning of the year that an improvement in sentimental relationships will happen thanks to the invaluable help of divine energy. Without a doubt, a favorable moment of favorable wind that cannot be unused. In relationships, the charm of the Dog will attract the other party in good manners, without ever hurt their self-esteem or cause any discomfort. In order to do this, you must be a patient person who knows how to keep the flame alive through affection and complicity. Singles will brighten their lives when they meet new people in the most unlikely places or in unexpected situations. The last six months of the year will be the most intense and full of social gatherings. It will be a good year for Dog natives to improve professional relations. It is a good time to prepare professional strategies and objectives for the following years. It is possible that during the year you will be burdened with responsibilities that will slow down your day-to-day. You will have to try to avoid them by being diplomatic when you reject them after the offer. Your ability with numbers will allow you to balance income and expenses, although you will have certain temptations that will make it difficult for you. However, you will end up realizing that it is a luxury that can only alter your financial capacity. Although the previous year there were a large number of conflicts that disrupted family life, in the year of the Pig misunderstandings are resolved and there will be little more than minor problems regarding family relationships. Therefore, in the Chinese Horoscope 2019 for Dog, some frustrations may arise from the slowing down of old projects, but thanks to illusion and hard work, they will finally end.